Whether from Heaven, Hell, or hiatus, the Winchester brothers always find their way back, and this time is no exception. 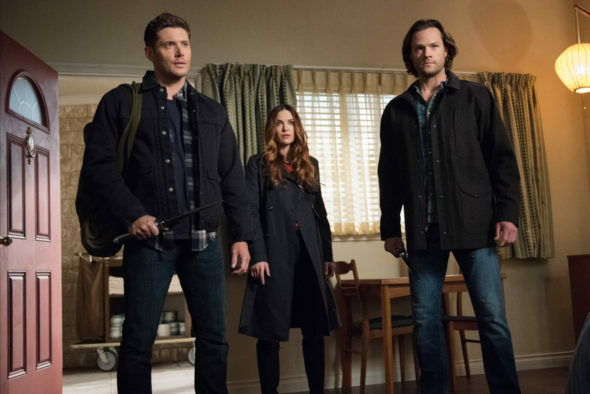 As expected, The CW has renewed its long-lived, successful Supernatural TV show for a 14th season. The boys will return to more dive bars and fleabag motels, carrying on their family business of saving people and hunting things. A CW horror drama, Supernatural stars Jared Padaldecki and Jensen Ackles as hunters Sam and Dean Winchester. The cast also includes Misha Collins, Mark Pellegrino, and Alexander Calvert. In season 13, they’ve been alternating between raising and tracking Jack (Calvert) — a powerful Nephilim — and trying to rescue their mother, Mary (Samantha Smith), from the void. Guest stars include Kim Rhodes, Briana Buckmaster, Kathryn Newton, Katherine Ramdeen, Clark Backo, and Yadira Guevara-Prip, who featured in the backdoor pilot to the Supernatural TV series spin-off, Wayward Sisters (and there’s no news on a pickup for that, yet). The 13th season of Supernatural is averaging a 0.59 rating in the 18-49 demographic and 1.79 million viewers. Compared to season 12, it’s down by just 2% in the demo, but is up by 7% in viewership. Even 13 seasons in, Supernatural remains one of the most-watched series among scripted CW TV shows. What do you think? Are you still watching the Supernatural TV series? Did you think it would be cancelled or renewed for season 14 on The CW? I have watched this show religiously since it first started. I got both of my children started in like season 3 and now I have my granddaughters watching! Both of them believe Dean & Sam are both true heroes! We have binge watched seasons over & over! I don’t know what the girls (6 & 3) are going to do when Dean & Sam aren’t out there ridding the world of the evil in the world!! This is an amazing show with an even more amazing cast! I hope it’s on for many years to come. I don’t have tv programming, I watch everything via DVD, I don’t know if that helps the ratings, but you need to know there are possibly a lot of people out there that watch this show via dvd only and not on the network. I just finished season 13 and I really need season 14 to understand what’s going on!!!!!! Supernatural is probably the only show on TV that we watch religiously. Sam and Dean are staples in my household and we’d truly hate to see it end. It has a very stalwart following and ratings be damned, we love that show! Cancel that show and you’ll lose people who watch your station. Even though they age, their precession allows for adding, so keep it going until there’s no story left to tell. Please. I will watch this show as long as they make it. Lifelong fan! Watched this show fr0m the beginning – and even rewatched on DVD! I have each season!!! This is my favorite show! Keep it going as the Winchesters are the best team around… and oh, just LOVE Castiel, Jack, and Gabriel/Loki! Love the ongoing storyline as well each episode! I now have my fiance hooked as well! What happened to show looks like show was replaced by The Charmed ones? ?